ALERT NEWS We protect our $$ but NOT our CHILDREN! 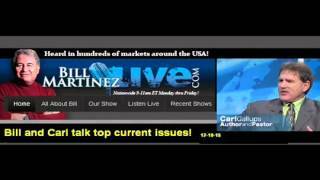 Carl Gallups on Bill Martinez Live! WE REPORT YOU DECIDE WHAT TO DO WITH THE INFORMATION AND CHECK HOME PAGE AND CHECK THE ABOUT BUTTON .. BUT FIRST PLEASE TAKE NOTICE AND READ. IF We Air a Video from someone else, IT IS BECAUSE We have PERMISSION To do so. This Christian Channel Has Many Different News,Teaching, Preaching, show’s.. Just like a regular TV Station YOU may watch what you find interesting to you. and comment, But be a Civilized Person any cursing, or insult’s or other hateful comments will be removed. ALERT IF ANY Video’s Offends you, then DO NOT WATCH IT.. .THIS Channel will NEVER be Politically Correct. we will tell the REAL TRUTH Regardless if you like it or not.